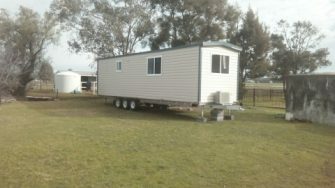 6m x 2.4m Tiny house. HI folks, I am selling the tiny house i recently made, I had some time off work with a knee injury recently so while I was off I thought I’d make a tiny house. 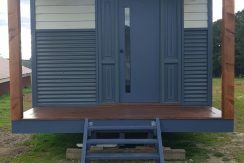 The tiny house has a outdoor bathroom (cladded in timber on the front of the tralier) which has a shower and composting toilet in it. The reason its out side in its own space is so the toilet doesn’t sink out the house being a smaller space. The composting toilet has a capacity for 1 or 2 people for 2-4 weeks before have to change the bucket which is as simple as opening the lid and taking out the bucket and putting a new fresh bucket in. The full bucket stays in the sun with its lid on for 6 – 12 months and then can be used as soil. The shower is in the same space as the toilet so it will get wet when used like in a boat. The main space is a kitchen hang out area with a full chiefs kitchen with oven, cooktop with rangehood, dishwasher (if you want it) and a front loader washing machine. The internal space has been inspired from the art deco ira and has many of those features such as a timber ceiling, recycled Kauri pine floor, Light fittings, staine glass front door. The colours i have used inside are inspired from the forest and design to encourage a calm feeling. Of the main space is the bedroom which has its own separate space and is able to be isolated from the rest of the house. It has a normal double bed on the floor, i don’t like loft beds i think it dangerous climbing up and down. The house has been design with solar passive design in mind, its designed to face north to the side with all the glass. It is insulated as much as it can be with thermal bats and thermal/acoustic bats around the bedroom. The windows i have used are beautiful secondhand timber windows. The round window is a coffee table top i made into a window. The house has been wired for 240volt so you can use all your normal electrical items that you would in any other house. It has been designed so it can be plugged into the main or the solar system can be plugged in. The trailer is cable of carrying 4.5tonnes however is only rated to carry 3.5tonnes at the moment dew to the front tow hitch. To carry more you would need to change the tow hitch. It has 10″ electric brakes, LED lights, made of BHP Australian steel, painted with rust proof paint and has roller rocker leaf springs. It is designed with a false floor underneather to store things- solar batteries, water tanks, tools ect. As a builder i don’t usually get to have design freedom as it’s not my home, i have really enjoyed being able to use my artistic design skills in this project and have used some of the prized second-hand items that I have been saving over the years. I think its a very well built, very well thought out and a beautiful tiny house. The price i am asking is what it has cost me for all materials and labor, If you look at other tiny houses of this caliber you will see a big price difference. I am after a quick sale as i am moving to Mexico to be with my wife and child. This is a great investment, if this is installed in a Newcastle back yard and rented for $250/week it could return a 20%PA investment.